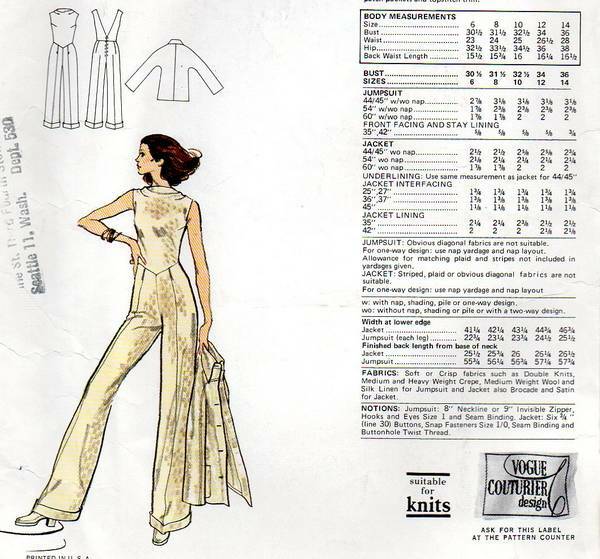 Vintage 1970's Vogue Couturier pattern. Sleeveless jumpsuit with bias front draped bodice and deep V cut out back. Cuffed, straight legged pants, pleated and darted into V-shaped waistline. Back zipper closure. Jacket has bias shaped collar. Back with forward seaming detail and front extending into full length kimono sleeves. Patch pockets and topstitch trim. Size 12; Bust 34; Waist 26.5; Hip 36. Pattern is uncut and complete. Envelope and contents are in very good condition. Comes with original sales receipt dated 1973.